How to enjoy Halloween 2015 with JoomlArt! SPECIAL OFFER: JoomlArt wizards will Halloweenify your logos for FREE. Enjoy the Halloween atmosphere with a simple game and win SCARY PRIZES. FREE JOOMLA MODULE - JA Halloween game for you to bring the Halloween atmosphere to your site. 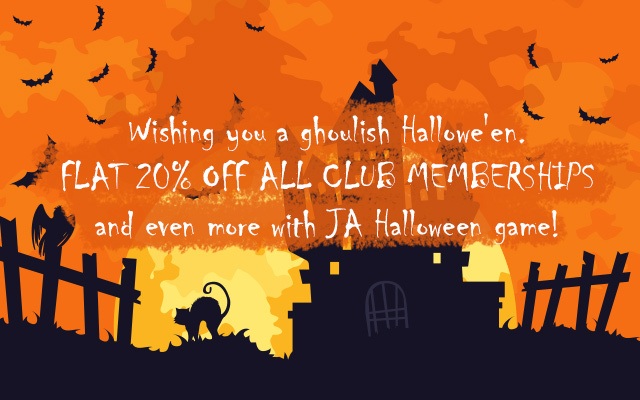 Scary discount for you from NOW until midnight 31st October at JoomlArt. Just submit your logo, and JA wizards will decorate your logo this Halloween. Your logo will look spookier than ever. Guaranteed. Enjoy the Halloween atmosphere with a simple game, with SCARY PRIZES. JoomlArt developed a free Halloween game module for your Joomla website. Just play the game in the Halloween atmosphere, may you be scarier than ever! And the fewer moves you make, the higher prizes you get! Show us your talent with this brain game! Finish with less than 30 steps, you'll win 30% OFF coupon. Finish with less than 40 steps, you'll win 25% OFF coupon. Above 40 steps, you'll win 20% OFF coupon. With JA Halloween, you set up a simple game on your site for the scary nights. Users can interact right at the front page. Simply find and uncover the same pair of Halloween cards, users with the less moves will win a special prizes. Enjoy our scary 20% OFF discount with coupon code SCREAM20. This code implies to all JoomlArt products Joomla templates and extensions. If you want more, try your luck with the Halloween game! That's our treats for you this Halloween. Do you have any scarier things to tell us? Love to hear them in the comments!